For other uses, see Leash (disambiguation). Purposes of a leash include: preventing animals from frightening or biting people or other animals, defecating and urinating in inappropriate places, endangering traffic, digging up lawns, causing other damage, getting lost, and getting away from owners. Leashes also provide a clear method of communication and ensure control during training of dogs. In the United States, leash laws are different within each state. While some states do not have statewide leash laws and give localities power to make leash law, there are some other states in which leash laws apply statewide. States that do not have statewide leash laws are Alabama, Alaska, Arizona, Arkansas, California, Colorado, Florida, Georgia, Hawaii, Idaho, Iowa, Kansas, Maryland, Massachusetts, Michigan, Minnesota, Mississippi, Montana, Nevada, New Jersey, New Mexico, North Dakota, Oklahoma, Oregon, Rhode Island, South Carolina, South Dakota, Texas, Utah, Vermont, Virginia, Washington, and Wyoming. In Connecticut, dogs are not permitted to run at large except in the situation of hunting. Still, if the dog has vicious propensities and the owner still allows it to run at large and a person is bitten, the owner can be fined for up to $1,000 and is also liable for 6 months of prison unless the victim has abused the dog and provoked the harmful behavior. In Delaware, dogs are not allowed to run at large unless in situations when the owner is present and has control over the pet. An exception is for farm dogs. Also, during the night dogs must be kept in an enclosure from which they cannot escape, firmly secured with a collar or chain or other device, so they cannot stray from the premises, or are under the reasonable control of the owner or custodian. If an owner does not respect these laws and if the dog bites someone, the owner is subject to civil liability and for fines of up to $1,500. Dogs in the District of Columbia must be kept on a leash as well. 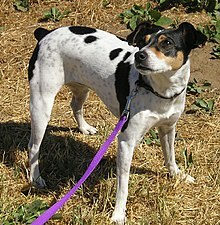 They are also not permitted on school grounds when school is in session or on any public recreation area without a leash. Dogs are allowed to run at large during the night in Kentucky only if they are accompanied by and under control of their owner. According to the leash laws of Louisiana, dogs are prohibited to run at large at all times of the day. The same law applies in Maine, where the only exception is for hunting dogs. Missouri legislation requires that dogs are kept in leashes that are no longer than 10 feet when they are in state parks or on historic sites. Also, dogs that have rabies are not permitted to run at large. In Nebraska, dogs may run at large only in counties where the population does not reach 80,000. New Hampshire legislation does not allow dogs to run at large unless they are accompanied by their owner or custodian or when dogs are used for training or are trained for hunting, herding or exhibitions. Illinois legislation prohibits owners from walking their dogs when they are not in a leash. Dogs in New York must be restrained or confined at all times of the day. However, certain NYC parks allow dogs off leash at certain hours. According to the North Carolina law, dogs are allowed to run at large during the night only if they are accompanied by their owner or a person who has received the owner's permission to do so. Ohio law requires one to “keep the dog under the reasonable control of some person,” but does not require a leash except for “any female dog … at any time the dog is in heat.” There are additional provisions for “dangerous dogs” that have injured a person or killed another dog. Pennsylvania legislation states that dogs must be confined or firmly secured or reasonably controlled by a person, within the property of the owner. Tennessee law prohibits dogs to run at large except in cases in which dogs are engaged in legal hunting or herding. West Virginia and Wisconsin are states that do not have a law that requires dogs to be leashed. Still, they do have laws that hold dog owners and keepers liable for all damages caused by dogs that are permitted to run at large. 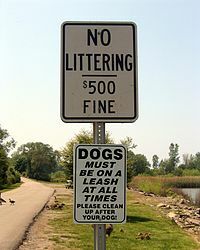 Different law applies to dangerous dogs and female dogs as in different states they are prohibited to run at large at all times. Also, in states such as Connecticut and Louisiana, guide dogs must also be leashed. Cat leashes are used with the purpose of preventing the cat getting lost. Unlike dogs, cats rarely attack persons on the street, so cat leashes are mainly a safety measure to protect the pet itself. Very often the collars are replaced with harnesses, because they avoid the dangers of collars which include escaping and running away or choking. Cats are more likely to not be willing to be walked in a harness than dogs are, and are considered to need up to months to be able to adjust to wearing a harness. Cat leashes come in a variety of colors, designs and models and are made of different materials. There are cat leashes made of leather, nylon and rope. Whereas the leather leash is one of the best qualities because of the characteristics of the material, it is also one of the most expensive and not very comfortable for the cat at the same time. Nylon cat leashes and harnesses are, however, more elastic, and thus more comfortable and also provide more control. Leashes are used on large animals—such as bovids, camelids, and equids—to lead them so that they will be forced to follow and come to a desired area—as well as to tether them to a specific area, such as to a fencepost or tree trunk, so that they will remain stationary and not run away. Oftentimes, leashes are used to tether such animals when they require separation, examination, or work to be done to them, such as grooming and tacking up. Among hunters, a collection of three hares ("a brace and a half" or tierce) or three creatures of any kind, especially greyhounds, foxes, and deer, is called "a leash". Child leashes, attached to child harnesses, ensure that young children do not wander far away from their guardians. The metal clip is attached to the harness that the child wears, while the other end containing the loop is held by the guardian. ^ "Comparing Bicycle-mounted Leashes". Archived from the original on 2010-05-16. Retrieved 2010-05-10. 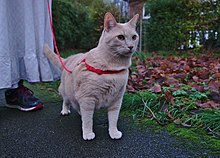 ^ "Cat Leash and Harness Devices". Archived from the original on 2010-05-07. Retrieved 2010-05-10. ^ "Delaware Leash Law". Retrieved 2010-05-10. ^ "District of Columbia Leash Law". Retrieved 2010-05-10. ^ "Missouri Leash Law". Retrieved 2010-05-10. ^ "Ohio Leash Law". Retrieved 2012-04-30. ^ "Wisconsin Leash Law". Retrieved 2010-05-10. ^ "Overview of State Dog Leash Laws". Retrieved 2010-05-10. ^ "Dog Collars Leashes". Archived from the original on 2010-05-22. Retrieved 2010-06-04. 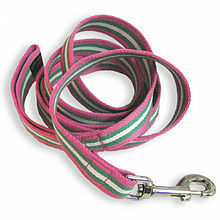 ^ "Dog Leash - How to Select the Best Basic Dog Leash". Retrieved 2010-06-04. ^ LLC, Aquanta. "Retractable Dog Leashes: Know the Risks". www.doghealth.com. Retrieved 2019-02-15. ^ Noah Webster, “Leash”. Dictionary, 1828.